At a time when being “thankful” is at the forefront of everyone’s mind, my team and I set out to determine the power of a thank you, more specifically a thank you call. Why make a thank you call when you could be making another ask and potentially receiving another gift? It’s a fair question, but it assumes the trade-off is simple; doing what feels right versus bringing in more donors and dollars. While I’ve always advocated to organizations I’ve worked with the need to conduct thank you calls, I wanted to better understand the ripple effect thank you calls can have in the following year. We analyzed data from four of our on-campus managed phonathon programs that conducted thank you calls in FY14 and tracked the results for all constituents that received a thank you call versus those that did not. We specifically looked at those loaded in current donor (aka lybunt) segments the following year. There were a couple clear trends that emerged as we dove into the data and looked specifically at pledge rate and contact rate. As can be seen in the graph below, prospects receiving thank you calls consistently out-performed their peers that did not receive a thank you call in the previous year. 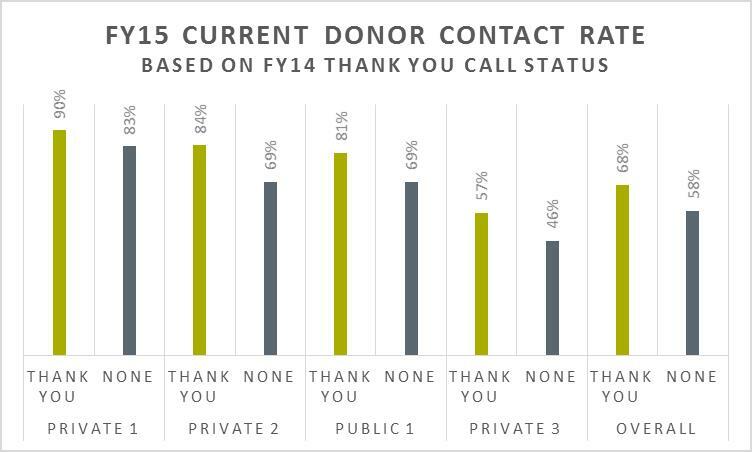 Connecting with donors at least one more time during the fiscal year allowed these institutions to capture updated information, which in turn increases the likelihood of engaging with them in the following year. There’s a very strong correlation between data integrity and donor retention rates. If you look at the combined impact thank you calls have on pledge rate and contact rate, on average, donors who are thanked are 51% more likely to pledge again in the following year. Considering the focus on improving ROI and increasing alumni participation at many organizations, this data proves thank you calls are well worth the effort. We analyzed the difference between accounts where the student caller had a conversation with the donor (live thank you call) and those where the student caller left a message. There’s definitely an advantage to having a live conversation, but even those that received a message ended up out performing those that aren’t getting any type of caller generated thank you call. For those wondering how results might differ for automated voice messaging, check out our blog in early 2016 for some additional analysis on that topic. It would be great if you could conduct thank you calls within a month of a gift being made, but logistically that’s not always possible. We analyzed the variance in results for thank you calls that were conducted at the end of the fiscal year versus those that were spread out quarterly. 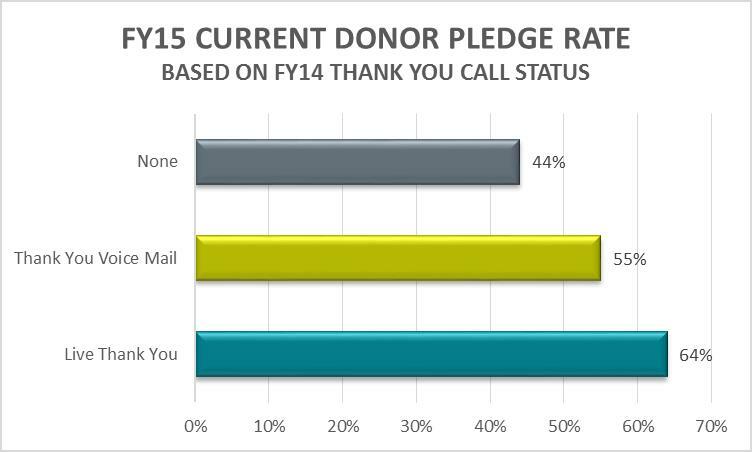 Conducting thank you calls more frequently did result in a higher pledge rate variance versus those that only conducted thank you calls in the last two months of the fiscal year. Even if quarterly is not an option, there’s still plenty of statistical evidence to show even thank you calls conducted at the end of the fiscal year will have a positive impact. Based on the data above and previous analysis we’ve conducted, there is no doubt thank you calls should be a part of every phonathon program. I encourage everyone to think about thank you calls as a long term investment in the future of your annual giving program. Please feel free to share your own thank you success stories. To find out how to add or increase your thank you calling, contact your RNL representative or drop us an email and we’ll help make a plan to thank your donors AND increase your results.